It was buildings like this on Pescadero Ave in Ocean Beach that spurred on support for Prop D.
Introduction: This is the second part of my series on the 30 foot height limit. This would have been published earlier except for a medical issue, so I offer my apology. At the risk of encouraging the critics of the height limit by continuing the discussion of the effects and value of the 1972 citizens’ initiative, this is meant then to demonstrate to those same critics the tunnels that have already been dug in and around and under the 30 foot standard, as well as informing the fairly new generations of citizenry and those uninitiated observers of San Diego development. 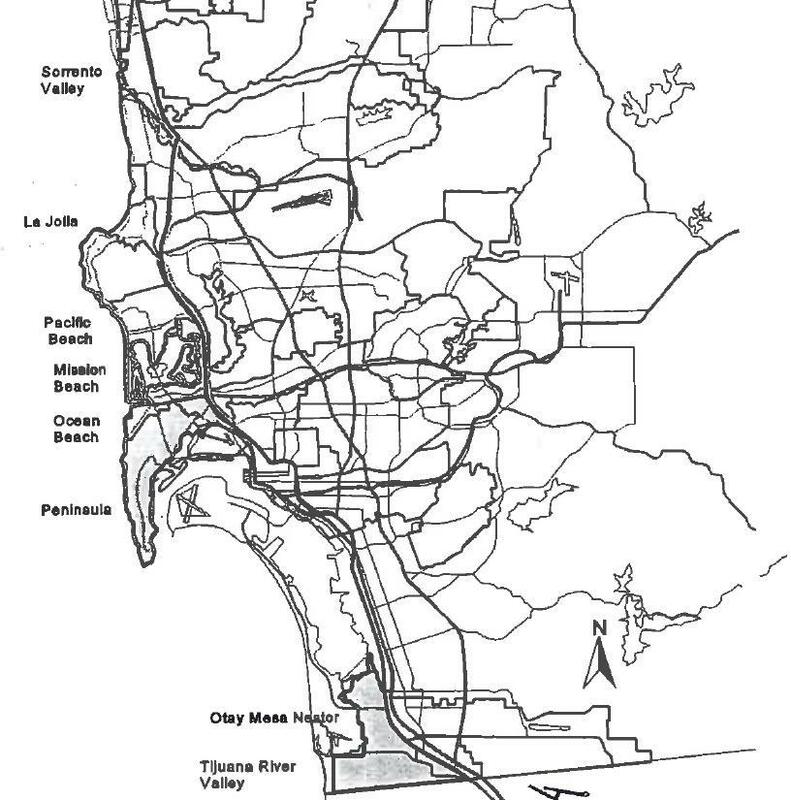 In Part One, I discussed how some of these tunnels have been dug underneath the height limit on San Diego’s coastal areas over the decades, outlining several serious breaches of the seemingly sacrosanct restrictions on building heights. Feeling that the ongoing online discussion on the issue with Voice of San Diego (see part 1) wasn’t complete without some kind of acknowledgement of how tunnels have already been dug under the 30 foot limit. The very first exception made was downtown San Diego – which included parts of Little Italy – this was implicit in the ballot proposition itself. Today, of course, this is a very, very BEEG deal. In 1972 the San Diego skyline was very different. All one has to do is check out the harbor downtown to see how this exception worked out. There have been other exceptions since the early Seventies vote. These include exemptions for SeaWorld, the Mission Brewery, the San Ysidro Gateway to the Americas – all specific pieces of property -, and the judicially-caused exemption for Liberty Station (aka NTC). Other places must have been grand-parented – such as UCSD – which has been building towering edifices for decades. 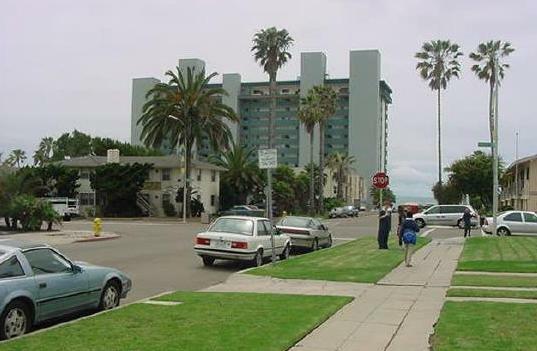 These exemptions were examined to remind critics of the 30 foot height limit – who blame high rents and property values at the beach and congestion inland on the restriction that applies just to the coastal areas – that indeed the limit has been undermined numerous times over the years, and that it is not treated with the respect it is due. The SeaWorld and Liberty Station exemptions stand out as particularly egregious slaps in the face of the voters who overwhelmingly approved the people’s measure 41 years ago, called Prop D, which was upheld by the California Supreme Court. 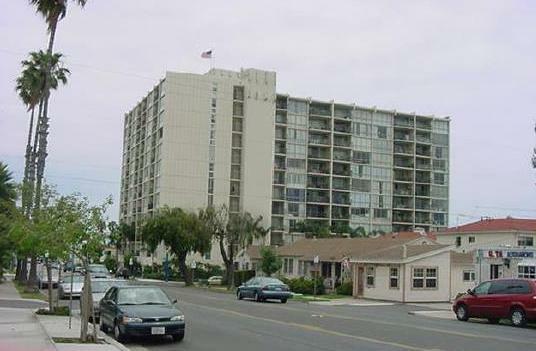 No discussion of the 30 foot height limit is near complete without discussing ways that individual developers and builders and the City of San Diego itself have gotten around the height restrictions. Once the 30 foot height limit was accepted and exercised for the coastal zone of San Diego by the mid-Seventies, it didn’t take long for developers and bureaucrats to find ways to circumvent its strict requirements. Two of the primary ways to get away with actually constructing a building higher than 30 feet was or is to jiggle with how and where you do the measurement, and importantly, which grade do you measure from, the “original” grade or the “finished” grade. For some, the measurement was an “average” height, for others you took the measurement from the low point on the property. These factors have been repeatedly pointed out by some of those involved in the recent online debates over the 30 foot limit, and who have been involved in the issue historically. We’ll look at some of these comments. Have you ever stood in front of a building in the Coastal Zone where the 30-foot height restriction is supposed to apply and thought the building you were looking at had to be higher than 30 feet? Chances are it was. Developers began interpreting the word “grade” in the original language of Proposition D, the 30-foot high building limit for the coast, as the finished grade, not the existing grade. That meant the developer could pile up dirt and raise the height of the building to pretty much any level he or she desired — that is, 32, 34, 37, feet. And this is true – to a great extent. For years, the City used the measurement to the “finished” grade, and not the “original” or pre-existing grade. And where that measurement is taken has changed over the years as well. City staff, developers, and planning committee members have all had different interpretations of Prop D. So, there’s been confusion as these different interpretations have battled one another over the years. The City finally stepped in and took control of how building height measurements are taken in the coastal areas under the rule of the 30 foot height limit. A mangled copy of the original Prop D.
In 1970, the Uniform Building Code spoke of building heights in terms of measuring the height from the highest point of the structure to the base which is the “finished grade”. This slip of the Prop D organizers was probably not a mistake, just an oversight of the development years down the road of what they worked for …. and in the end, the ordinance itself allowed developers to pile on dirt on the l0t before taking the measurement. 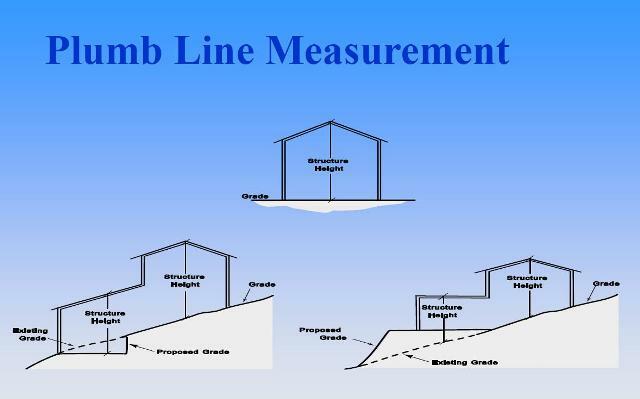 The proper method of measurement, per Proposition D, is in accordance with the Uniform Building Code of 1970. This office has previously opined that for the purposes of complying with Proposition D, measurements should be from the finished grade of a site, rather than the pre-existing grade. To the City’s credit, it recognized problems in taking the height measurements using the finished grade, particularly for buildings on slopes, and certainly the coastal zone and all its canyons, cliffs, hills, and bluffs – provides many slopes and views to build on and for. The city realized that this was not the intention of the voters when they overwhelming passed Prop D, the 30-foot high building limit for the coast. So, it changed the method of measurement and changed it to using the existing grade or proposed grade which ever is lower. The City did this by supplementing the language of the original Prop D so as to force developers to meet the voters’ intent. The current supplemented code forces the developer to measure 30 feet from the finished grade or the existing grade — whichever is lower. In order to flesh out the discussion, I emailed a number of past and current members and chairs of a few planning committees in the area, including the OB Planning Board and the Peninsula Planning Committee, asking if anyone had experienced or seen projects where they believed the developer was jiggling the grade and or the measurement. These are folks who by sitting on the planning bodies have dealt with the realities of the efforts to circumvent the height limit, and are not only aware of the issue on a theoretical basis in front of their keyboards, but in the day-to-day world of construction and remodels. A number responded and responded in the affirmative, that ‘yes’ they had experienced examples of where developers got around the 30 foot height limit. Yes. absolutely. completely changing their ‘original’ definition. Since 1999 increasing the grade has been a repeatedly debated issue in all parts of our Peninsula community. The use of ”ways of measuring the grade” which was once ‘clearly defined,’ also seems to have changed, several times since I’ve been involved on the planning committees. In addition, a former planning committee chair told me, that a project on the corner of Plum and Lowell in Point Loma had “shenanigans of this nature”, in that the grade was built up and the measurement wasn’t taken from the original grade. The planner recalls the builder getting caught because a nearby neighbor got involved and made it an issue, and it was changed. Another planner recalls a project on Lucinda Street where the architect was caught changing the elevations on a series of plans, all violations of the 30 foot height limit. People have definitely taken advantage of bluff elevation. The problem with measuring the height on a slope has to do with the necessary surveys that are supposed to take place. … What the City requires regarding a survey from an owner is not enforced and without a proper survey, before the design is done, the grade can be adjusted higher. Unless a knowledgeable neighbor notices what is going on, they get away with it. We have heard from City Staff, that the City’s “pre-building inspectors do not check anything more than the drawings” as they have in the past for compliance before permits are issued! Most times, they haven’t even ‘looked at on site, the slopes in contention! This is the problem. When we contacted the City, they said … they do not have the staff to check existing conditions on a property and have to take the owners word that the information on the plan application is correct. The only way they will know anything different is if someone from the community alerts them. The problem in this case was that we did alert them and it fell on deaf ears, which is not at all unusual. The problem with measuring the height on a slope has to do with the necessary surveys that are supposed to take place. This was what I discovered on Lucinda. What the City requires regarding a survey from an owner is not enforced and without a proper survey, before the design is done, the grade can be adjusted higher. Unless a knowledgeable neighbor notices what is going on, they get away with it. One wonders why so many other architects are fine and work ‘within the rules’, yet so many ‘consider themselves special’ asking for far more than a ‘minor variance’ and keep ‘coming back’ for variances with additional projects, requiring similar ‘grade level variations’. It’s not as if they ‘don’t know’ the rules, then, is it? There are a number of architects who work in the Pt. 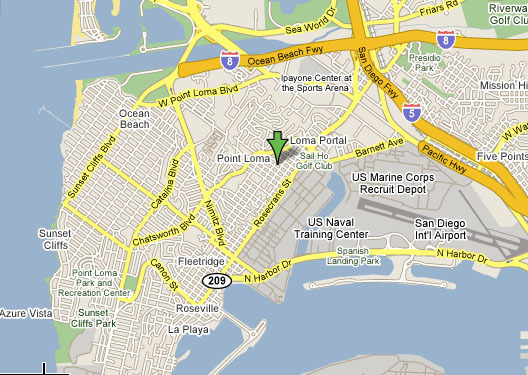 Loma area who are expert at helping developers circumvent the laws. One time-honored path for getting around community building requirements is for developers and owners to request “variances” for their projects and remodels. In Ocean Beach, for example, the City staff have been granting variances to some property owners that allow them to get around OB’s blueprint for community development, the OB Precise Plan. It’s gotten so bad in OB that the Planning Board has called for a “Moratorium” on variances in one area of northwest OB particularly stressed with pressures of gentrification. The Board has been inundated with requests for variances. 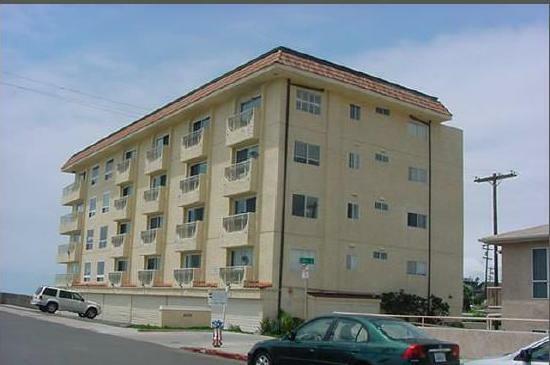 … The Bishop’s School in La Jolla wants an exemption from Proposition D and its supplementary code to build a 32-foot building. They want to revert to measuring from the finished grade. If this exemption to the current code is allowed by way of the “variance” process, it will set a precedent for the Coastal Zone, and developers will happily revert back to measuring from the finished grade and again build 32, 35, 39-foot buildings. If this variance is granted, similar variances cannot be denied to other developers. As time progresses, your peek-a-boo view will disappear, the winter shadow of the adjacent building will come further over your property and the wall of condos along the beach will grow a few feet higher as more variances are granted. The La Jolla Community Planning Association (LJCPA) recommended the denial of this project, and the San Diego Hearing Officer approved it. This demonstrates how local planning committees, made up of volunteers, whose members change with the seasons, have been buffeted with demands and pressures from developers, who can afford to hire professional staff to do their planning, PR, and presentations. There is no question that planning boards and committees are at times manipulated by developers with financial interests at stake in whether certain projects are approved and built. Developers have placed friends and relatives on some of these boards. This can happen when community members ignore their own planning bodies or are ignorant of the planning issues of their particular neighborhood. After many experiences with the City, I can say that they will do anything within their power to allow a development despite any information they receive. If you ever watched the process before the Planning Commission or City Council, City Staff always sounds like they are working for the developer instead of providing an objective report. The language they use is completely unprofessional as they praise projects. 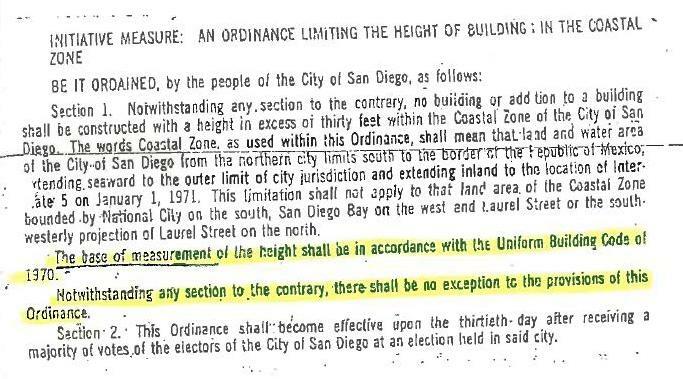 (a) Notwithstanding any section to the contrary, no building or addition to a building shall be constructed with a height in excess of thirty feet within the Coastal Zone of the City of San Diego. And even though the statute says that “the base of measurement of the height shall be in accordance with the Uniform Building Code of 1970,” which as stated earlier, takes the measurement from the “finished grade”, another statute corrects this. Section 113.0270 of the Municipal Code states “grade” is either the existing or proposed grade, which ever is lower. Every few years, community activists warn of an assault on the 30-foot height limit. Proposition D remains as strong as when it was approved by voters, regardless of disputes over how the 30 feet is calculated; community plan updates which critics contend will weaken the height limit; amendments to planned district ordinances; or the new state-mandated affordable density bonus. I want to take all the criticism of the 30 foot height limit, drive a stake right through its heart and bury it deep. In a recent OB Rag poll, nearly three out of 4 respondents indicated their support for the thirty foot height limit – with a good portion wanting to see the limit extend throughout the City of San Diego. 58% supported it and agreed that it was “passed in the public interest by the public”; another 15% want to see it “expanded throughout much of the rest of” San Diego, and obviously support it, for a supportive total of nearly 73%. * Prop D: A voter approved height limit (30 ft) that applies to coastal development in geographic are generally west of Interstate 5. * Development over 30 feet (per Prop D measurement) requires approval of City of San Diego voters. Prop D has survived, despite the tunnels dug to undermine it. But as money drives development in the coastal areas, there will continue to be pressures on the people’s ordinance, and developers will continue to find ways to circumvent its standards. Yet, the more who are educated and aware of the issues and its history, the more who will appreciate the effects that preventing a wall of buildings at the beach or on the cliffs is in all of our interests. This is still an important issue for all San Diegans – not just those who live at the coast – as sooner or later we all go to the beach or the cliffs – but in the end, this is not about views, it’s about quality of life regardless of where you live. And it’s important to understand the history and manipulations and machinations that developers, big business and the City use to get around initiatives that emerge from the grassroots, as Prop D truly did. Is a 4-story building allowed here? OKay, you North Parkistas – (or is it “North-Parkers”) get your planning documents out. What’s the height limit in that area? I’m writing in regards to a condo complex being built on Carleton St. (the old Kettenburg Boatyard) in Point Loma; This building is way over 30ft and I’m curious as to how this gets approved. Do we know who is responsible for making these decisions? Is this the jurisdiction of the Coastal Commission? And if do how does the average resident fight this stuff? Thoughts?